The Steeler.com website says it best! 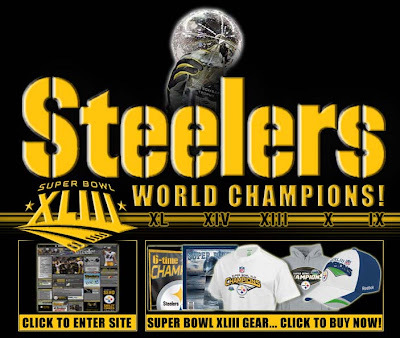 Pittsburgh Steelers are the Superbowl XLIII World Champions! Wow, what a game! When I purchased the Janome MB-4, I realized there was probably going to be a lot to learn and it would take a lot of reading to understand how to work it. I'm happy to say that I'm doing well with learning the machine. Changing Threads - I don't know about you but I'm starting to dread threading a needle. Some of the "auto needle threaders" available don't help either. The best trick I learned with this machine so far is for when changing thread. I'm sure this is well known already but when I changed thread on my sewing machine, each time I rethreaded the whole thing. When you are ready to use an additional thread color outside of your 4 active available bays, you cut the thread closest to the spool you are removing and then tie it to the thread of the new spool. Loosen the tension and pull the new thread through the thread path down to the needle for the quick color change. Beats rethreading the whole thing. Stabilizers - Boy there are so many types. I'm just getting experience on some of them lately. In the past, I've only used stabilizer on the backs of T-Shirts to stiffen for quilting. Lately I've been introduced to wash-away and "stitch and tear" stabilizer. Both work well for clearing leftover stabilizer. I found this stabilizer cheat sheet on Nancy's Notions website that was very helpful!